No doubt that London 2012 Olympics are the event of the year in Britain, attracting a huge number of visitors from around the world. Many will probably take the chance to explore a little more besides London, thus here are a few ideas for 5 awesome short breaks, suitable for a wide array of experiences. Have you ever fancied feeling like James Bond, even only for a little while? If so, you'll certainly enjoy indoor indoor skydiving at Bodyflight, the largest wind tunnel in the world, where Daniel Craig trained to play the free-fall from s plane in the film Quantum of Solace. A short training with the excellent instructors showing the basics and you're ready for a thrilling experience, flying up and down, possibly also walking on the walls. If after thrilling skydiving you are looking for something more relaxing, other nice attractions in Bedford include the Saddleworth Museum, the Bird of Prey Centre and, on selected days, a boat ride on the river Great Ouse on the ‘Artful Dodger’. The easiest and quickest way to reach Bedford from London (approximately 100 km, 60 miles) is by train, leaving from St. Pancras and other Stations. Looking for a cool and funky atmosphere, vintage shops plus great nightlife? You're likely to enjoy Brighton. Apart from the lovely sea shore, which however is likely to be packed in Summer and even more during the 2012 Olympics, Brighton offers a unique charm with its 'rétro' flair and trendy scene. Don't miss a visit to the excentric Royal Pavilion, stroll throughout The Lanes, with the charming boutiques along the narrow streets, have fun looking at the vintage shops and bars in North Laine, discover the cosy bohemian Kemp Town village, have a long walk along Brighton Beachfront or admire the many beautiful examples of Street Art. Brighton is approximately 85 km (53 miles) from London and can be easily reached by train and by coach. If you like outdoors, hiking and dramatic sceneries you are likely to fall in love with Beachy Head. Imagine high and steep white cliffs, the sea beneath turning from grey to blue, and the meadows. When I went there, last August, I felt enchanted. The walk from Beachy Head to the Seven Sisters (and even further to Alfriston) is easy and suitable to anyone, and rewards hikers with the stunning views on the beautiful chalk cliffs. To reach the starting point of the walking path, the best option is to take the bus from Eastbourne. Similarly, there's no need to walk all the way back, as you can easily catch a bus from Alfriston. If you don't have a car, the best option to reach Eastbourne from London (103 km, 64 miles) is by rail. Two of the major attractions of delightful St Albans are the Verulamium Park, where once stood the Roman city Verulam. Within the Park, the small Museum exhibits wonderful Roman mosaics exquisitely designed that archaeology and art lovers will surely appreciate. Another highlight is the magnificent Cathedral, with its beautiful mixture of romanic and gothic styles. The Cathedral was raised on the site where Alban, the first Christian martyr, was laid to rest at the end of the 3rd Century A.D. and is the city most remarkable landmark. St Albans is only 43 km (27 miles) from London City and well connected by rail. Photos and story contributed by Simon Falvo, editor of Wild About Travel. 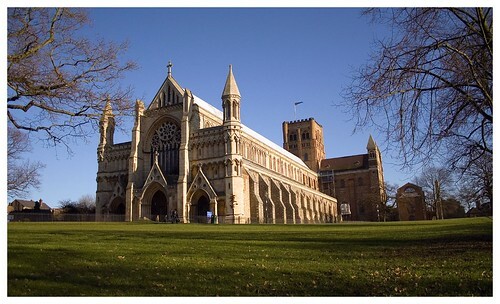 St Albans Cathedral Photo Courtesy by Skinnyde on Flickr. BodyFlight Photo Courtesy by BodyFlight.